2/3 years the best Husband can look forward to for Fathers Day is the assortment of goodies from the Fathers Day stall, lovingly handpicked from the backs of closets by frugal mums determined to use the stall as a spring cleaning mechanism. We've had opened packs of lollies. A pen set with half its ink gone. A small personal hygiene set including an ear scratcher thing that looks suspiciously like it has wax on it. Our favourites though are the handmade goodies from school and daycare. Usually there's some cute little item with a photo of our cherub on it. Maybe it's a toobox made from paddlepop sticks. Or a framed picture with a magnet on the back. Whatever, we both have drawers full of the handmade and handpicked treasures. We wouldn't throw away any of them, because there is alot of laughter and love in our home on Fathers Day, served up with breakfast in bed, eaten for you by your own personal 2 year old taster. Occasionally I muster myself to improve on the situation. Husband loves it when I come out with some kind of experience or tickets to something. It's not often, but often enough that he will hopefully browse the different experience websites at this time of year. 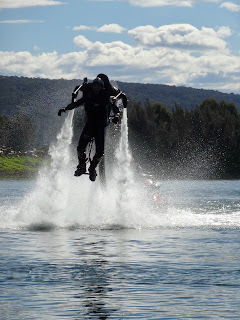 So you can imagine how tickled he was when I was approached by Giftitnow to do a review of their Jetpack Experience. And even though I have vowed to cut back the sponsored work now that I am back in the office, I took this one on. Wow. Was it worth it. We turned up without doing any of the right research first. Husband asked tentatively in the parking lot, "was I supposed to wear speedo's?". Uh, yes dear. You were. Husband was packed into a wetsuit in the parking lot, cheerfully stripping down to his knickers first, and strapped onto a ginormous looking backpack. A comprehensive safety conversation first, and he was out in the water (bahaha in August, brrrr) with instructions to make like superman on his first run through and stay low with his arms out. We were reassured that everyone dunks it in the water first time round, and I eagerly awaited the moment with my camera. Didn't come. 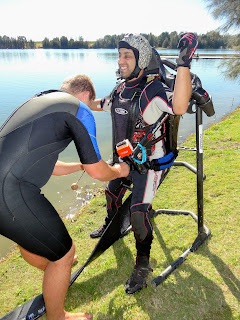 Husband was a natural and hovered around the lake with water streaming at high volume from the pack strapped to his back. The jet ski acts as the power, but the flier controls mostly where they go. 2 runs around the lake and my husband was flying high (no idea how high really) and doing the running man in midair as well as various other encouraged stunts. The grin never left his face, and he was bouncing on the side of the lake waiting for his next turn. The team at Jetpack Australia were so friendly, supplying chairs to sit on lakeside for us watchers, an eski full of drinks for everyone, and plenty of fun chat. If you're looking for something a little different for Fathers Day, and opportunity that will have your Husband showing the complimentary video off to all friends and family (tediously) for the next few weeks, this is definately something to consider. We had a blast, and Husband is hinting that he won't say no to another go. Jetpack experiences are available in various locations, and retail from $249. BUT, right now for Fathers Day, Giftitnow have a sale on reducing the price, and just to sweeten the deal, I've negotiated a 10% discount for my readers. Just use code mummyheartsmoney at checkout, for a 10% discount sitewide, specially for Fathers Day. 10%! Just because we got to have a go. Yay us. Cannot recommend the gift of memories enough - we will be talking about this for years. For those of you wondering - yes - Husband came home with no knickers on. They were saturated. I would so do this my self stuff the husband lol.